SuperValu Grocery Store | World Living Water Systems Ltd.
Mike Belich owns the SuperValu grocery store located in North Vancouver, Canada. Mikael Lund, owner of World Living Water Systems Ltd, frequents this supermarket regularly. Prior to installation of the Vortex Water Revitalizer, the produce section at this supermarket would most often look poorly and the produce wilted very quickly. Mikael approached Mike, telling him about his concerns for the produce in the store, and how the Vortex Water Revitalizer would be of great benefit to his produce and would save him money. Mike Belich installed the Vortex Water Revitalizer on to the water spray system in his produce section, after the pump. A complete transformation in the quality of his produce. A longer shelf life for produce. We installed the Vortex Water Revitalizer approximately 1 year ago. We have noticed a great increase in our produce quality and freshness. The produce keeps for a longer period of time. I am very happy with the system and would recommend it without hesitation. Our staff was unaware that we had installed the Vortex Water Reviitalizer, and had commented on the freshness and look of the produce, plus our sales are increasing weekly." Mikael Lund: "You bought this system from my company, World Living Water Systems about a year ago. What are your observations so far?" Mike Belich: "So far its been working fabulous, our produce looks as good as its ever looked or better. People haven't even noticed that we've put it in but they know somethings' different." Mikael Lund: "How did your produce look before the Revitalizer?" Mike Belich: "It was looking wilted and just shop worn, but now its Revitalized! I swear by the Revitalizer." Mikael Lund: "What is the financial benefit to you?" Mike Belich: "Increase in sales, not so much produce loss due to shrinkage, customers look at the produce and buy with their eyes. They notice it, our produce sales are up. I'm happy." Mikael Lund: "What about your staff?" Mike Belich: "They had no idea I put it in, they're always commenting how fresh the produce looks. I didn't even tell them I put it in; we just put t in one day and never looked back. Better and better. Sales are on their way up. It works, don't ask me how it works, but it works. The produce looks great, people comment on it every day. I'm a happy camper." 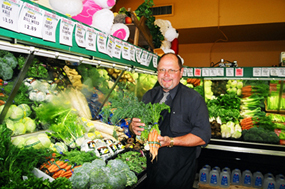 "I would recommend this to anybody that's selling fresh produce, it keeps the produce alive."